Drive two and a half hours through 40 kilometers of endless fields of Cetina valley and refresh yourself by swimming in the Cetina River. Our expert guides are available to give you detailed instructions and make sure you enjoy the fun and 100% safe experience of ATV Quad in Dalmatian hinterland and intact nature. 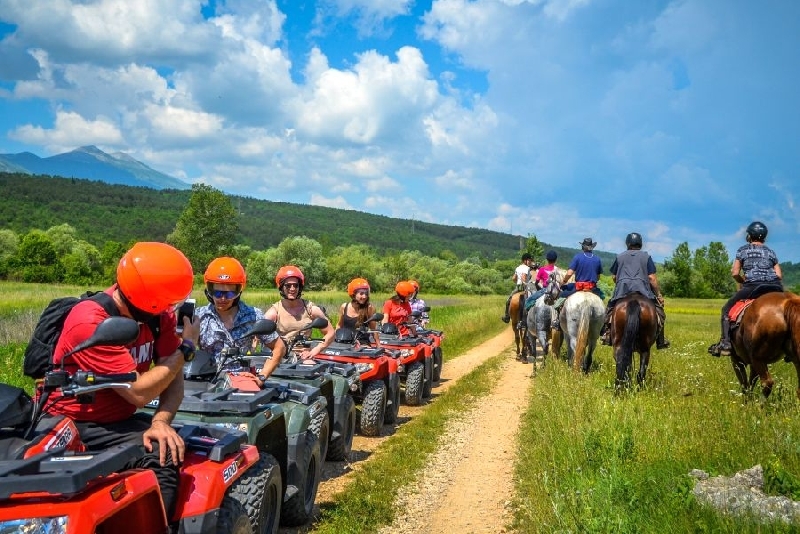 For true nature lovers who want to enjoy the beautiful landscapes and the beautiful Cetina river, the cleanest and longest river in the area, our family tour is tailored to all ages, especially beginners who have not met up to now with ATV Quad vehicles. After your arrival, you will be welcomed by experienced long-time guides, followed by getting acquainted with ATV vehicles, short training and getting ready to make each participant feel safe while driving. For true nature lovers and sports extremes we offer over 50 miles of customized paths for a variety of driving safari where you take things in your hands through local roads, macadam paths, rivers, mountain ranges and canyons, stopping at some of the many amazing locations of the Dalmatian hinterland. Enjoy the Quad Safari with Enjoy Split!